Hypertension, or high blood pressure, occurs when there is too much force on your arteries as your heart beats. Blood pressure is typically read as systolic blood pressure (the pressure when your heart muscles contract) over diastolic pressure (the pressure when your heart is refilling with blood). A blood pressure reading might look something like 120/80mmHg. When the top number (systolic) is over 140mmHg, or the bottom number (diastolic) is over 90 for an extended period of time, it may indicate that you have high blood pressure. There is no one thing that causes high blood pressure. In fact, most cases of high blood pressure have no clear cause. However, there are many factors that can contribute to high blood pressure. Blood pressure may occur from obesity, frequent stress and anxiety, excessive alcohol consumption, smoking, and too much salt in the diet. Some groups of people are predisposed to having high blood pressure like older adults, African Americans, individuals with diabetes, and individuals with a family history of high blood pressure are at a higher risk for high blood pressure. In other cases, another medical condition or medicine can cause high blood pressure. 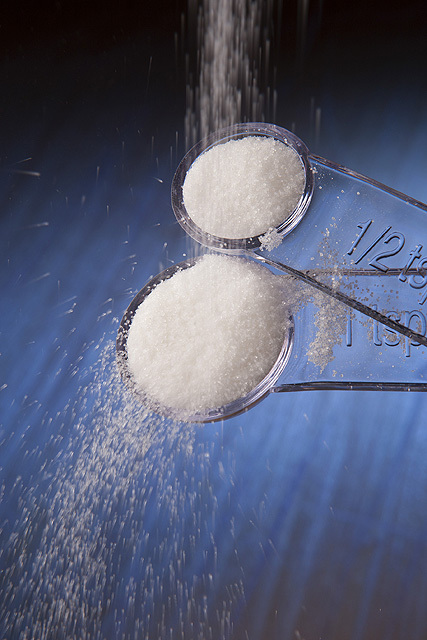 Sodium – How Much to Get? For the average American, the recommendations for sodium intake is 2,300mg per day. Americans typically eat well above the recommended 2,300mg at about 3,400mg of sodium per day. 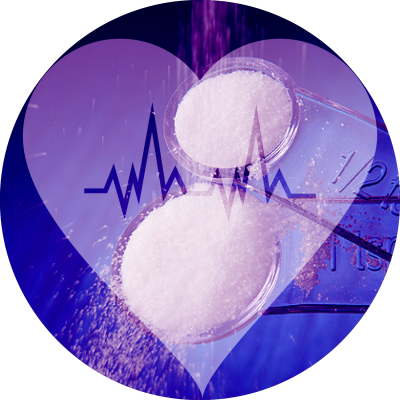 Reducing sodium intake can reduce blood pressure and risk for other diseases. Talk to your doctor about specific recommendations for how much sodium is right for you. When buying canned vegetables, search for “low sodium” or “salt free” on the label. If you cannot find a low sodium canned vegetables, rinse off your beans and vegetables before cooking. That will remove most of the added salt. Remove the salt shaker from the table! On average, 10% of the sodium in our diet comes from the salt shaker. Often, our food is seasoned well enough without adding the extra salt. Put away the salt shaker and spice up your life! There are hundreds of herbs and spices in the world that you can use in cooking instead of salt. Try making your own special blend of herbs and spices to put on your dishes. If you don’t feel comfortable with creating your own spice blends try salt-free alternatives like Mrs. Dash, McCormick, or Tony Chachere’s salt-free seasonings. For general cooking (with the exception of baking), try using less salt than what the recipe requires. Your dishes will often taste the same. When using soups, broths, or stocks in cooking, look for salt-free or low sodium versions to greatly reduce sodium in your foods. Still want more ideas for alternatives to salt? Check out the ultimate infographic guide to spices. Meditating is a quick and easy thing you can do at any time. Meditating twice a day can help reduce stress, blood pressure and additional risks of other heart diseases. Start your meditation off small, by meditating for 5 minutes twice a day and work your way up to 20-minute sessions twice per day. Physical activity is not only good for maintaining weight, but it is also great for managing stress! Exercise releases hormones in your body that make you feel better. For adults, it is recommended to get 150 minutes of exercise per week. Check out our previous post for more info on the importance of physical activity. Losing even a little bit of weight can reduce blood pressure and/or prevent high blood pressure in overweight people. To achieve this health benefit, a weight loss of 5-10% of your total body weight, or about 10 pounds, is needed. Eating fruits and vegetables has been associated with lowering blood pressure, and a lower risk of hypertension. Meal patterns like the DASH diet have been shown to reduce blood pressure significantly. The DASH diet recommends that individuals on a 2,000 calorie diet eat 4-5 servings of vegetables, and 4-5 servings of fruits every day. What’s in a serving? Self-monitoring is a great way to keep your health goals on track. Some grocery stores have machines to measure blood pressure for free, or you can purchase an at-home machine to check your blood pressure. It is important to visit your doctor on a regular basis if you have hypertension and take your medications as needed. Your physician can also refer you to other services that can help you manage your blood pressure. American Psychological Association. Exercise: a healthy stress reliever. Updated 2013. Exercise: a healthy stress reliever . (accessed 2 February 2015). Rainforth MV, Schneider RH, Nidich SI, Gaylord-King C, Salemo JW, Anderson JW. Stress reduction programs in patients with elevated blood pressure: a systematic review and meta-analysis. Curr Hypertens Rep. 2007;9(6):520-28. Sumathi Reddy. Doctor’s orders: 20 minutes of meditation twice a day. The Wall Street Journal. Updated 15 April 2013. Doctor’s Orders (accessed 2 February 2015).